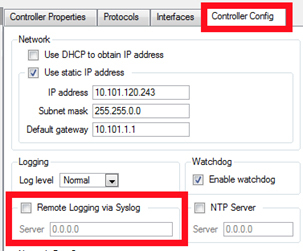 Within the Network Tab, you’ll need to select the controller that you wish to pull the logs for.Then click the “Web Interface Button” . Once you click the Web Interface button the Mosaic Web Interface will launch in your default internet browser, it is recommended that you use Internet Explorer for this. You will now see all of the controller’s actions since the last reboot. The current log level will be indicated in title block. Critical errors require immediate attention. Normal errors are reported to alert users to potential problems. 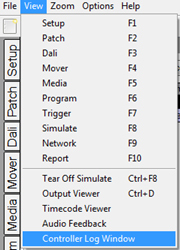 Debug is a highly detailed logging level and contains all controller information. This level is only recommended when users are doing high level troubleshooting. General is a step-by-step account of all activity including input/output. For example, RS232 serial strings, and trigger matching. It is extremely useful in helping debug complex interfacing and triggering arrangements. System is a less verbose log of the Controller's system activity; it is useful for examining the boot-up sequence to help debug problems. Once in the WebUI, you will have the option to either save or clear the logs. To save the logs click on the save button. This will open a save dialogue. Be sure to save the file with a .TXT extension. For readability sake, I’d recommend using Notepad ++ to read the logs. 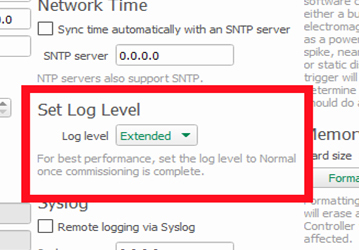 Log levels can be changed via the controller configuration pane within the Network Tab. Be sure to apply changes via the commit button in the lower left corner. 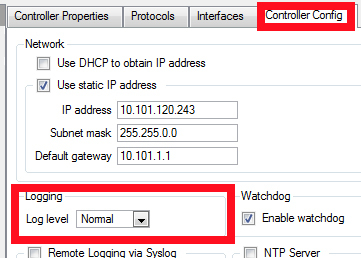 To enable remote logging via a specified IP address, you must first specify the IP address of the server and enable the function. This feature is enabled and configured via the controller configuration page.